Water is a building’s worst enemy. If a building’s components are not protected from exposure to water, serious structural damage can result. The ground around a building should be sloped to direct surface water away from the foundation. This is a crucial element of design that is often overlooked by builders and developers. 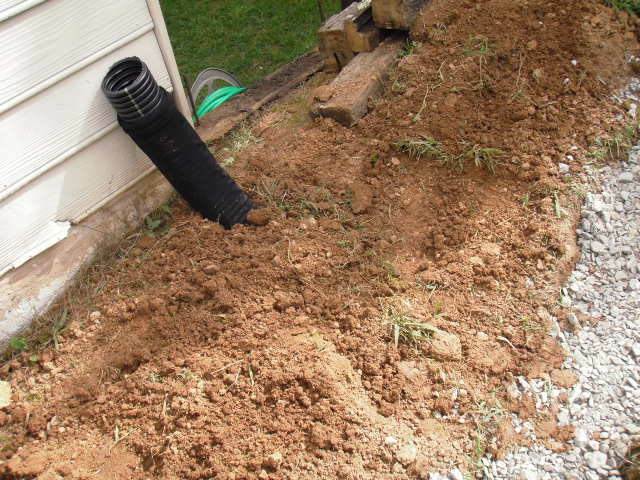 When the ground slopes toward your home or business, surface water can get inside through the foundation walls and cause settling, decay, and mold to set in. Mold on Wall. 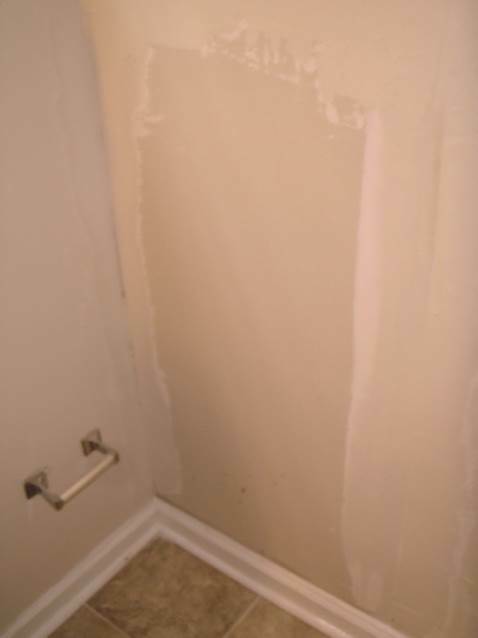 The sheetrock on this bathroom wall was waterlogged and very moldy. Utility Locate. Buried utilities were marked before digging began. 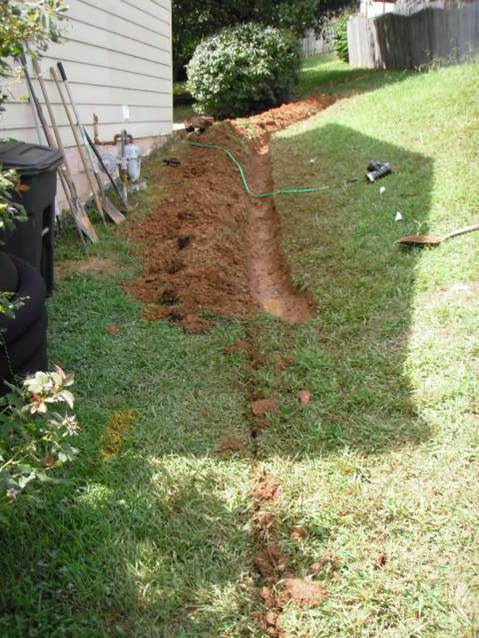 The ditch had to be hand dug due to its proximity to an existing natural gas line (yellow stripes). Hand digging. The trench was slowly widened and deepened to prevent damage to the natural gas line nearby. Ready for Drain. Once the trench was dug, the drain was laid out beside it to be cut to length. System Install in Progress. Drain is in place and gravel is being placed over it. Completed Drain System. Gravel is left exposed at ground surface to better intercept water. Soil from trench is piled on low side of trench to create a berm that further prevents water from escaping. This berm can be landscaped with grass by customer. Downspout Connection. 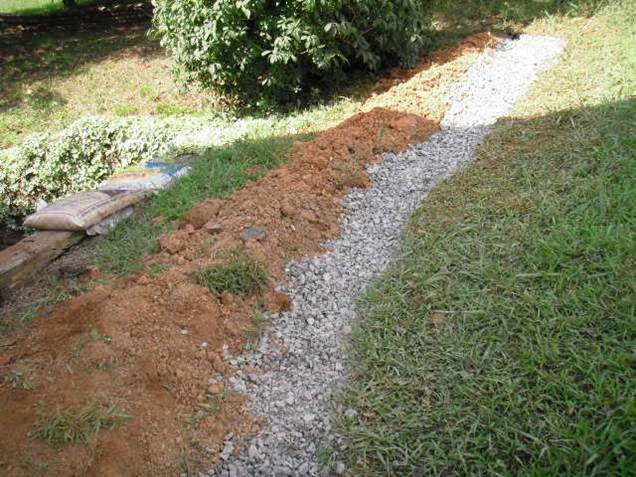 A tee was installed in the drain line and a section was added to allow a gutter downspout to discharge into it. New Sheetrock. Sheetrock has been replaced and is in the process of being finished. This customer had a home which was located on a hill below several others. 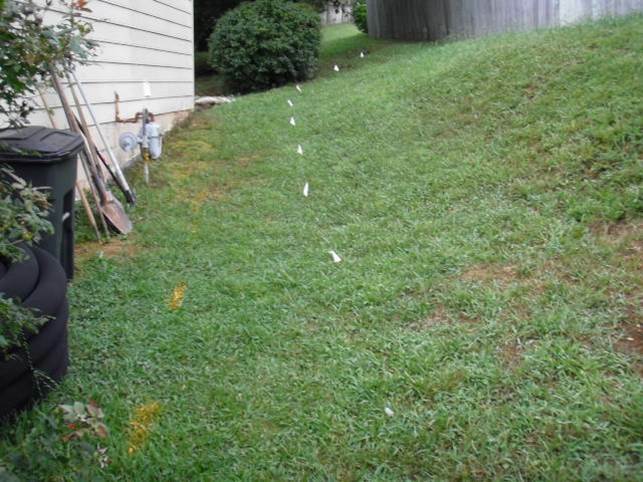 As a result, water from all these properties was running downhill to his yard and infiltrating his foundation during rain events. The exterior siding and the sheetrock on the interior of his home was being damaged by this water. Water is a building’s worst enemy. 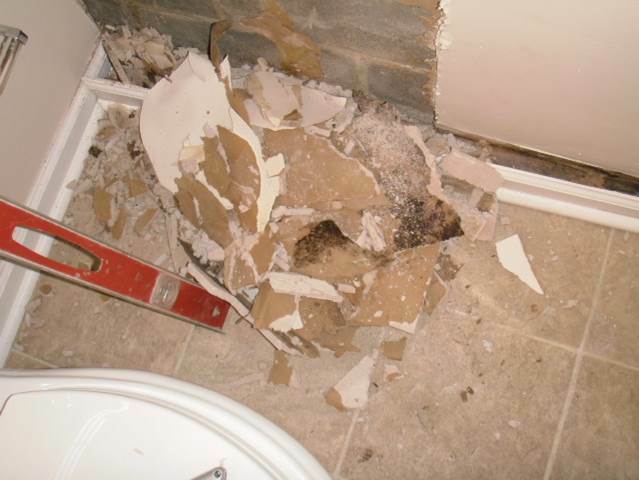 If a building’s components are not protected from exposure to water, serious structural damage can result. 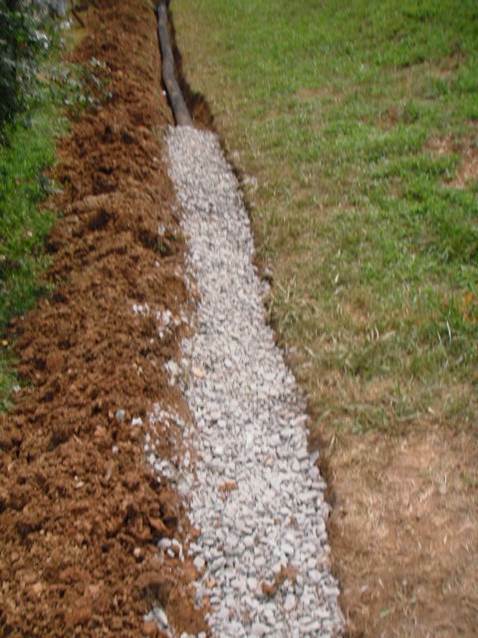 The ground around a building should be sloped to direct surface water away from the foundation. This is a crucial element of design that is often overlooked by builders and developers. 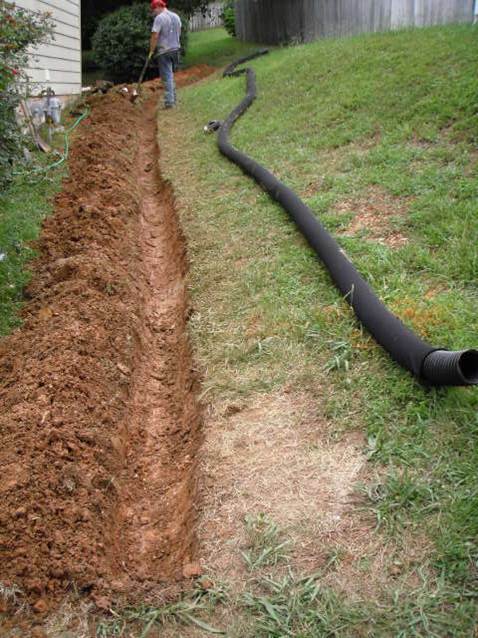 To rectify this problem, Green River installed an 80 foot drain to intercept and move water from the adjoining properties away from the building. We also tied in the home’s gutter downspouts that were in proximity to the drain, to move that water away as well. 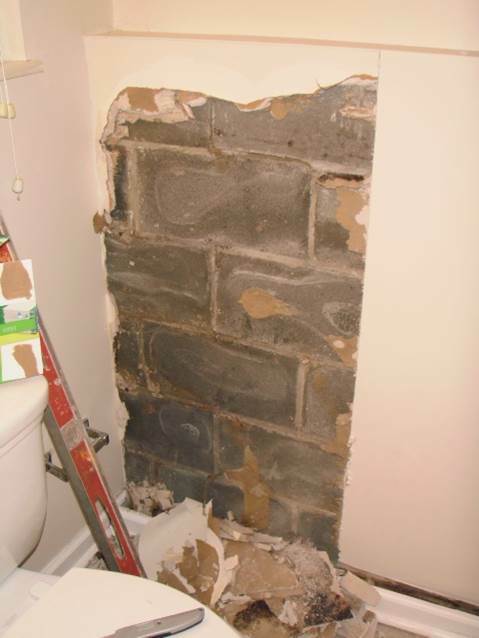 A small section of the home’s retaining wall was rebuilt and the interior bathroom wall was repaired by removing and replacing the sheetrock.